NEW INTERVIEW SERIES! Ubassists of the World – Gunnar Hjorth (Sweden) – Play UBass! I’m super exited to post the first (of hopefully many) interviews in my new series. To kick of this series I asked my long time friend Gunnar Hjorth if he wanted to be my first interviewee. On Saturday 8th of March 2014 I visited him in his studio. Besides the interview we also got to do a quick Ubass duet jam in his studio! Pure fun! so this is a translated transcript of the interview). M: How come you play the Ubass? 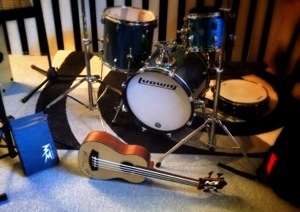 G: It is a fantastic instrument, fun to play and very versatile! I’m mainly a guitarist but do play quite a lot of bass in different situations, live and also on different recordings in my studio, I have been looking for a bass that gives me a big sound but also is easy on my hands. If I play a lot of electric bass I often get blisters on my finger tips. Since this is the case I always have to take this into play when I’m about to do some electric bass recordings. Recording bass and then wait a while until the next session so I don’t get blisters. Then suddenly I come a cross a instrument that sounds almost like an upright bass, is totally ergonomic and easy on my hands (body), fun to play and with a fat/full sound and fits the hands of a guitar player perfectly! M: I know you play a lot of classical guitar that requires nails on the right hand fingers to be able to get the desired sound. G: Yes, and here lies a big part of the problems that faces a guitarist that wants to play bass. M: Playing bass however requires short nails to get a full/round sound. G: Exactly, I have to turn my fingers to a certain angle to avoid nail sound. M: So you have found a technique that works? Is it easier to use this technique on a Ubass than it is on a regular electric bass? G: It’s a lot easier on the Ubass! Much because the strings are less tough on the fingers/nails than on a regular electric bass. If your nails touch the Ubass string they won’t break because of the softer material. 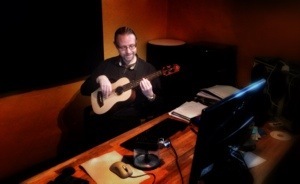 (Gunnar talks about the original Pahoehoe strings here. Thunderguts and Silver Rumblers by Aquila are also softer on the fingers. These three are the most common string choices for the acoustic/electric Ubass). This makes the feeling more similar to an nylon guitar than a electric bass. I can use more of my classical guitar technique on the Ubass than I could on a electric bass. M: Do you play only with your right hand index or middle fingers or are you using your thumb as well? G: Yes, sometimes I use my thumb to get a more fluffy and round tone. But I do play a lot with my index and middle fingers and it works really well. M: What turned you on to the Ubass? Where did you find out about the instrument? G: Well, I heard a good friend play the instrument and it sounded so very nice and felt like a really cool instrument. I got very interested in the Ubass and wanted to find out more so I asked him a lot of questions that he answered gladly! I thought about it for awhile and started looking for them in the music stores but they were hard to find so I ended up buying one online. Once I got the Ubass I started to play it for a couple of months to get to know it before I brought it to a gig. M: To get more familiar with the feeling of the Ubass!? G: Yes. Playing the Ubass has become increasingly more fun and nowadays I almost always prefer the Ubass instead of a regular bass if the situation let me choose! 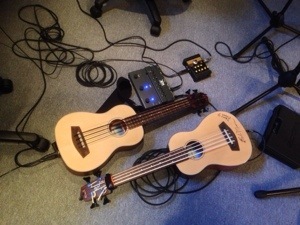 M: I think that it is quite easy to get used to playing the Ubass. And for a guitarist I presume it will be more like a guitar since the scale length isn’t so far from a regular guitar. G: It’s very easy on the hands. M: You don’t have to stretch your fingers that much on the Ubass. G: You can use your basic guitar technique. I also think it has the possibility to get a lot of different and diverse sounds. I like the fact that mine is fretless. I really love the fretless bass, maybe because I have played with a great fretless player for many years! M: Did you hesitate when you choose between the fretted or fretted model? G: No, for me it was the fretless I wanted to play. M: Did you have the chance to try both models before you ordered your fretless? G: Only a quick test. G: I felt it was a bass instrument I could invest time practicing without the fear of getting blisters after a short while! M: I do recommend the fretless, or at least that you try it out before you decide. If you’re used to play a regular bass the change to a smaller scale length can take some adjustments and the lack of frets will help you avoid playing on the fret wire since this will produce an unpleasant sound. G: I wanted to get a sound close to the upright bass because I’m interested in jazz music and I have been using my fretless Ubass on music in that style. M: How long have you had your Ubass? M: And after about two months you started to use it live! G: Yes, but I did stare a lot on the fretboard to play in tune. It has however been easier and easier to play in tune in the 21 inch short scale. M: When you play the Ubass what styles do you play? We have already talked about jazz. Are there other styles you play live and in your studio? G: I have been using it on Latin inspired music (from ex. Brazil…) and also pop songs. You can vary the sound a lot so I think it is a versatile and all-round instrument. M: So by varying the playing technique you can get different sounds? You can easily go from a upright-like tone to a snappy pop sound just by varying the playing technique. M: That’s interesting. You might think that the rubbery original black strings should be very round sounding but they can really sound very snappy and short too! can you recommend other musicians that don’t have bass as main instrument to start playing the Ubass? G: Yes I can, and I do! 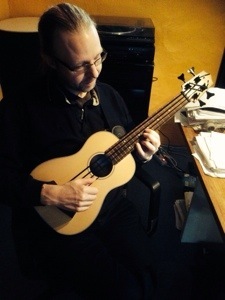 There are people I have played with that have picked up their own Ubass, wanting to have that tool of expression too! The Ubass has so many benefits! I can really recommend it to other guitarists that want to have a great bass instrument in their toolbox. And it isn’t too expensive! M: I know that many guitarists (and people with other main instruments too) have a home studio and might want to record, for example, music that ”requires” the sound of an upright bass. Why not play it yourself instead of trying to record it on a midi keyboard with an upright sound patch! G: It will be a more live/living feel and maybe even more authentic than if you play on the midi keyboard keys.